"It wasn't just the baby that died that day; something inside Sick Boy was lost and never returned." The line that, once crossed, destroys any last remaining sense of hope. It could be for a cause, a person, a situation, or simple survival. A character has given up on it, and there is no going back. It can lead soldiers to despair — or even suicide, if they don't simply lose the will to live. It can turn an Ideal Hero into an Anti-Hero or an outright villain, or even, in some cases, vice versa. It is a vital element of Tragedy. Coming near this line is quite common in fiction; frequently, at the end of the second act or the 45 minute mark of a drama or the first hour of a film, the protagonist comes dangerously close to the edge before a Rousing Speech or Deus ex Machina or the like comes along. 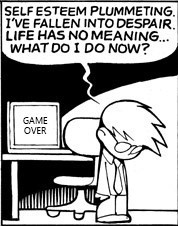 It makes for a Downer Ending if the protagonist does fall over the edge. Frequently, this is when the What You Are in the Dark test hits him. Alternatively, many stories have a hero "Fighting the Good Fight" and meeting someone who'd been at it longer and lost all hope. This is often a goal of some wars. Break the enemy's morale, and you can achieve victory even without military success. Related to Heroic BSoD and Heroic Safe Mode, except the hero usually comes back from those. A Woobie, Destroyer of Worlds is often a character who crossed this line long ago. It can result in the character entering an Angst Coma, being Dumb Struck or suffering Death by Despair (and subsequently crossing the Moral Event Horizon or Jumping Off the Slippery Slope). Often a result of We Used to Be Friends or some variants of Personal Horror. This is often the final stage of the Break the Cutie process. In a video game, often happens during a Bleak Level, and it may be relevant if the game has a Morale Mechanic. May be preceded with a Hope Spot, just to really twist the knife. And a Downer Ending might follow in really dark stories. Often a factor in Pater Familicide. May be feigned by critics engaged in a Critic Breakdown. Compare Safety in Indifference, Hope Is Scary (the reason nobody ever crosses the horizon back again), Hope Crusher (someone who delights seeing characters crossing this horizon, or even worse, pushing other people to cross the horizon). IMPORTANT: This is about a character losing all hope, not merely getting depressed, upset, or bored.